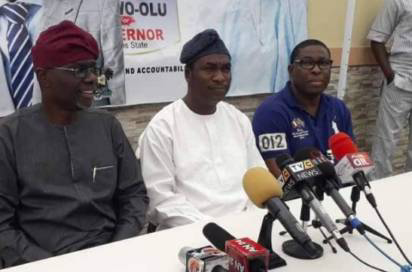 Governor Akinwunmi Ambode’s bid for a second term as governor of Lagos State on the platform of the All Progressives Congress, was on Saturday threatened further as rival aspirant, Dr. Obafemi Hamzat withdrew from the contest to back Mr. Babajide Sanwo-Olu. Hamzat was the candidate of the Justice Forum while Sanwo-Olu represents the Mandate Group. Both groups are the major political blocs in the Lagos State chapter of the APC. Hamzat stepped down at a press conference this morning after a visit to the Ikoyi, Lagos residence of Sanwo-Olu. Party leader, Asiwaju Bola Tinubu is being expected to speak on the developments in the Lagos chapter of the party at the APC secretariat later today. Party operatives are already gathering.